A sad day it is for all Terry Pratchett fans (like yours truly). The master of discworld has gone a bit Bursar - more accurately, he's just been diagnosed with Alzheimer's. As someone who's enjoyed his books immensely, I'm glad he wrote them down as he did, in such profuse quantities. I just finished reading Wintersmith a few weeks ago - didn't like it enough to write a review about it though. But on reading this news, the only thought was to boycott the series if some greedy publisher tries to push it forward with a ghost writer. Considering what happened to Pern (Dragon's Kin? Gimme a break) or Dune (*bleh* on Chapterhouse Dune) - I'd hate to see that happen to Discworld. Truly, Alzheimer's is a sad sad way to lose a mind - to fade away, while the body remains. Personal sn't the same as important. -- Terry Pratchett, "Men At Arms"
I've been a great fan of Terry Pratchett ever since the day I started reading the Discworld novels. Rather than raw fiction, it is philosophy, social commentary and a sprinkling of cynicism, which makes his books so enjoyable. The last in the line of books is Thud! (read it to get the Him diamond quote) started to read the Science of Discworld and sort of looking around for Wintersmith. So just out of curiousity, I started counting the Pratchetts I've read and as it turns out, I've read 42 of them. Here's a quick list of what I've read (in no particular order). If you liked Douglas Adams and wanted him to be more Tolkien, while making fun of the modern world - pick up a Pratchett, any one. Ach, crivens !, wish'e could squiggle a neece ending to all yen tales - ye ken ?. [A Human] ... is merely a means for a book to create more books. I don't have a laptop and the hospital anyway doesn't allow any electronics inside anyway. So I ended up lugging a couple of dead trees conveniently pulped, flattened and printed on. 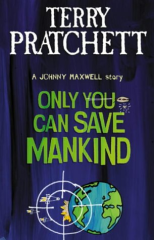 The chosen few were from the Johnny Maxwell trilogy from Terry Pratchett - Johnny and the Bomb and Only You Can Save Mankind . Both these books are classified as young adult fiction, but Pratchett's no Enid Blyton and doesn't try to replace her either. There is no Faraway Tree or Wishing Chairs in here, only a boy who can't filter out the wonders of this world and an old lady who's got time on her side. The total unreality of Johnny's world is different from the fairyland of the average adult fiction book. remembered that one of them was black. For all that brilliant social commentary Pratchett is capable of, he just can't write out an ending to a book. 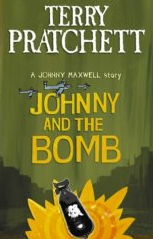 Almost all good Discworld books were left hanging in status quo, which you can't do with a book like Johnny and the Bomb. There's a bit of closure missing in the book which sort of justifies its events with the ending rather than the other way around. Dark humor of Tom Holt too convey this disturbing sense of too many very convenient coincidences. Nobody but Wodehouse in Pearls,Girls and Monty Bodkin has written that perfect book where the audience is giggling away at the simple coincidences piling up to set up a ROTFL ending. But in that case, the twists were quite random and as surprising as the first time I read Oscar Wilde's Model Millionaire but multiplied many times over. Johnny and the Bomb doesn't even belong on the same shelves. In other words, the book doesn't really keep you guessing. Only You Can Save Mankind on the other hand has a bit more material to it, especially if you put yourself in the early nineties with CNN broadcasting the Iraqi night sky with the Scuds, Patriots and AAA tracers flares included. The total disconnect a pilot feels between pressing a button and real people dying is palpable and carried into the book with clarity. The initial messages from the alien spaceship and the very obvious absence of a Don't fire button are all digs at the guilt free violence that the war breeds in a real world, only here transported into a twelve year old's video game. The player respawns, but the enemies die forever which sort introduces the guilt factor while shooting down an enemy fighter. Also buried in there are prods at the allied forces about the Geneva Convention and similar codified rules of war. The requirements of similar treatments for POWs as well as a blatant disregard for civilian collateral damage were highlighted in the game but the suggestions go a lot further than what just happened on your screen. Remember Vietnam, Agent Orange and hot Napalm. It is quite unfortunate to say that you had to be there (or at least put yourself back in the '90s) to actually read between the lines of this book. These books are for all those who sat by watching the bombs drop over Baghdad and witnessed the 'taking out' of several strategic hospitals and bunkers. A fourteen year old in 2006 will not find the irony or relive the horrors reading this book - he (or she) just doesn't have the context. The books paint a blood red sunset to the west and spotless hands of those who pressed the buttons. So to simplify - I liked the stuff between the lines, hated the ending and liked the characters (totally). Reality is hard to live with - Unlike Johnny, we can't cope. How do wars start ? Diplomats tell lies to journalists, and they believe what they read. I picked up Good Omens a while back. The reason I bought it was because I saw the twin pairs of the hardbounds and in a moment of book lust decided that I'd buy the paperback. And a few feet away, perched on top of a bookshelf was the cheap paperback edition. From desire to demand and satisfaction in five minutes. The moment I opened the book and read the first three pages, I knew I needed this book. The last time I felt this pulled in by a book was when I read the this is not her story in H2G2. These are those fateful lines - read them and understand. God liked to work done early in the morning while he was feeling fresh. The basic idea of antichrist as being neither good or bad, but merely a mass of potential was interesting. Especially interesting are the side jokes, like Death's comments about Elvis or the hell hound transformed into a mongrel. Also there are the philosophical question of an angel and a demon co-operating as is observed between solidiers who have more in common with each other than with their superiors. Side references to the uncertainity of the result of Doomsday also raise questions about religion without directly denying the omnipotence of God. A lot of interesting things compressed into a paperback, and that's why I like it. Also got my hands on the The Truth, which is quite in the league of Going Postal. Quite enjoyable, except for the portrayal of Sachrissa which could've been a little toned down (bosoms and black dresses, y'know). And quite an interesting insight into the world of Unorganized crime in Ankhmorpork. That book was hard to put down but when you're through you're through. The typos in the news paper motto was funny - the truth shall set you fret and the Worde family motto - mot juste. Now, I have Thud left to read. I guess I'll wait for the paperback to come out. I finished reading The Last Continent over the weekend and was wondering where Pratchett went wrong. The book is a lost cause in philosophy - complete with a God of Evolution, the continent EcksEcksEcksEcks and Mrs Whitlow. Then there's the obvious parodies of Mad Max and Skippy the Bush Kangaroo. It is about time and space. The more geography you have, the less history you had. Origin of the name EcksEcksEcksEcks for the continent. If it had been called BEER, they'd have trouble spelling it after the third. The book looks as though it was written while Pratchett was on vacation in Australia. I wouldn't really read it again unless I was on a desert island waiting for a boat.